Before our history began, another now forgotten civilization thrived. The people who roamed Early Earth were much like us: curious, emotional, funny, ambitious, and vulnerable. In this series of illustrated and linked tales, Isabel Greenberg chronicles the explorations of a young man as he paddles from his home in the North Pole to the South Pole. There, he meets his true love, but their romance is ill-fated. Early Earth’s unusual and finicky polarity means the lovers can never touch. I’ve been pretty comfortable in my book slump over the past few months, I’ve taken to calling it my anti-book den. I’ve got snacks, I’ve got Diet Coke, I’ve put my gym pants on (the ones that have seen the gym once… and that was an accident) and I’m fine. I’d taken to glancing wistfully at my book shelf, wishing, hoping, that the next book I would read would be The One. A few weeks ago I attended a spur of the moment free talk on graphic novels as part of the Manchester Literary Festival*. It was chaired by Paul Gravett, a comic book Big Wig and all round lovely guy, and featured the graphic novelists Gareth Brookes (his books sounds extremely odd but really ace!) and, the lady herself, Isabel Greenberg. I didn’t really make many notes, unfortunately, but I really enjoyed the talk and, rather by accident, learnt a lot about graphic novels and their artists. I’ve always loved graphic novels but I always seem to take the relatively “safe” route when it comes to reading them. Meaning, basically, I’ve read most of the Major Graphic Novels Everyone Knows About (MGNEKAs) but I don’t delve deeper into the lesser known artists. I’m not really sure why but hopefully I’ll change that soon, especially after I came out with a list of great recommendations to British graphic novelists that sound brilliant. Anyway, like I said, I unfortunately didn’t take many notes but I was convinced that I had to buy The Encyclopedia of Early Earth by Isabel Greenberg. I’m just going to ahead and call her Isabel because I feel once you’ve ventured down the darkest alleys in Manchester to go and see someone talk about their book, you’re pretty much on first name terms. First up, on a completely superficial level, this book is gorgeous. You really can’t see how beautiful the cover is on pictures but it’s so wonderful and resembles those fancy coffee table books. And I’m all about the coffee table books. The insides are just as beautiful. Yes, the beauty of this cover is mostly because of the fantastic drawings by Isabel, but the whole package is gorgeous. And it looks beautiful on my shelf. Which is important. Because I’m ridiculous. It’s difficult to go into the story of The Encylcopedia of Early Earth because I don’t think I really read it as a story. It was more snapshots of the fascinating and intricate world that Isabel has created in Early Earth. The characters, the folklore, the mythology, the stories and, of course, the pictures and the presentation (the font was made from Isabel’s handwriting – a lovely touch!) all work together to make a stunning work of art. I remember a part of the talk when Isabel said that she wrote the stories as prose first, because she doubted her ability to convey story in pictures. I’ve got to tell you, she’s got absolutely nothing to worry about. 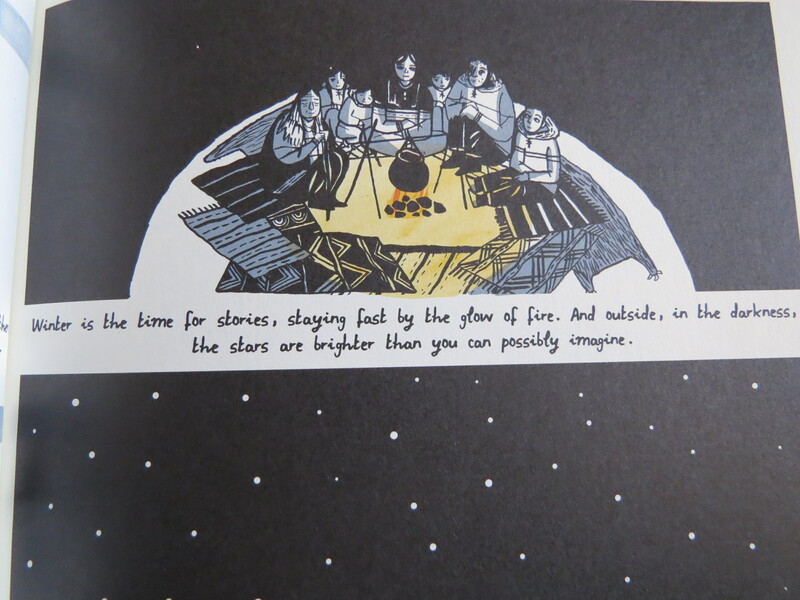 Every page of every story is rich and full of beautiful illustrations with a subtle, yet superb colour scheme. I could quite happily stick all of these drawings on my bedroom wall and get lost in them when the light is failing outside. This book is a celebration of words and stories and imagination. As a storyteller, you can imagine how much I love this. It’s lyrical, it’s different and it’s so lush with detail that you are completely removed from the dullness of everyday life and transported to places where people gather around fireplaces, swapping words. Absolutely recommended, especially for these wintry days because, as we all know, “winter is the time for stories”. *I know, I know, usually I write these things up but that week unfortunately doubled up as one of the most faffiest ones of my life so… sorry! It was dead good though.